It may be cold outside, but don’t let it get you down. 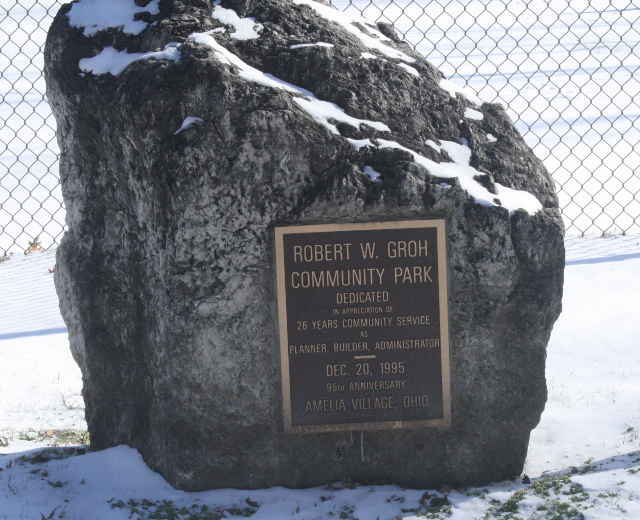 Small community parks like the Robert W. Groh Park in Amelia, Ohio, are just the place to get your body moving, and raise your spirits. 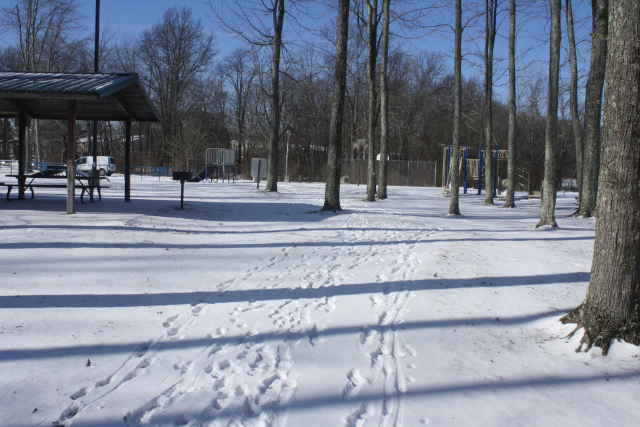 Located at the entrance of the Woodside Park subdivision on Huntsman Trace, it is easy to find, easy to use, and a fun way to have a brisk winter walk even in snow and ice. 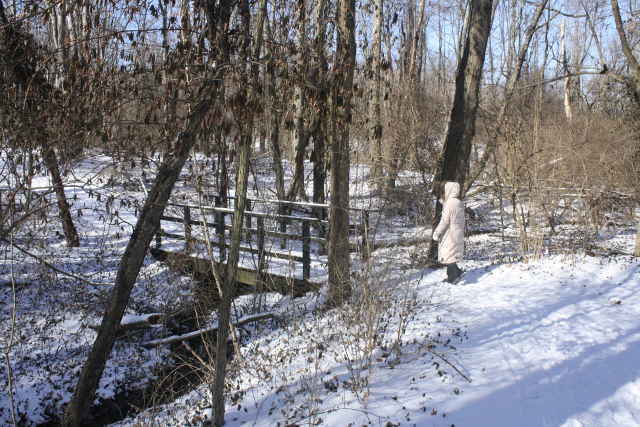 We walked on Sunday, January 14, 2018, with a temperature of 19 degrees, sunny conditions with snow and ice on the ground and trail. The trail is an asphalt paved trail that goes in two loops on opposite sides of the parking area. There is playground equipment, a shelter with picnic tables, a basketball court, and a skateboard ramp at the parking area. The trail goes toward the houses in the subdivision around an area with trees in the center, and circles back to the parking area. The trail then goes around an open field on the opposite side of the parking area through the woods that surround it. We walked both trails, walking through the woods twice to make a one-mile walk. The trail was not cleared of ice or snow, so we had to be careful as we walked. Traffic Noise: Even though the park was right on the road, and next to a subdivision, there was very little traffic at the time. Historic Points of Interest: Amelia is Clermont County’s only incorporated village that was never formally laid out, which is why it doesn’t resemble the other villages in the area. This is because the area slowly filled up during immigration from New England States, among others, until it reached a point that triggered incorporation around 1900. It was originally called Milton, but when a post office arrived and the town had to have an official name, they found the name Milton had already been taken, so it was decided that it would be called Amelia, after Amelia Bowdoin, a popular tollgate operator on the Ohio Pike. Her tollhouse (and personal residence) still exists at 94 W. Main St.
Robert W. Groh, a mayor of Amelia for 18 years, has several commendations for his accomplishments and dedication to the people of Amelia and his achievements, including recognition from the Ohio State Representatives. 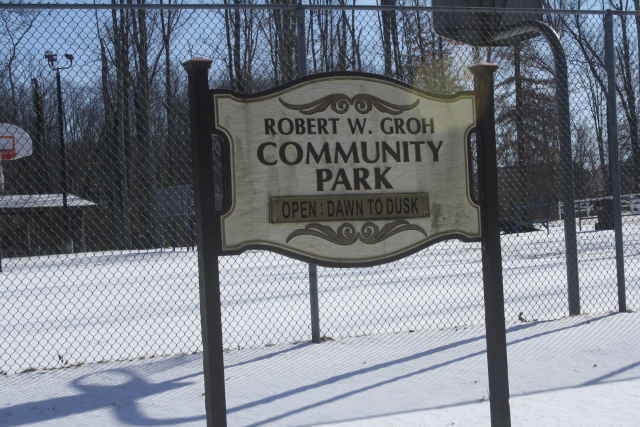 Overall Rating: Robert W. Groh Park may be small, but it is the perfect place to walk on a bitter cold day. We felt like kids again as we stomped through the snow, making snowballs, and breathing the clean cold air. Wearing the right clothes and shoes can make a huge difference in being comfortable outdoors in the cold. Through trial and error I found wearing insulated hiking boots are the best for keeping your feet dry and warm, and they provide good traction on ice. Insulated mittens (not gloves) are the best for keeping fingers warm. Columbia brand makes some outdoor water repellent pants that are lightweight and roomy, great with long underwear underneath. Parkas made with down are the best for keeping your body warm, as again, they are lightweight and roomy for wearing layers underneath. Another thing to keep in mind is how you move your body. 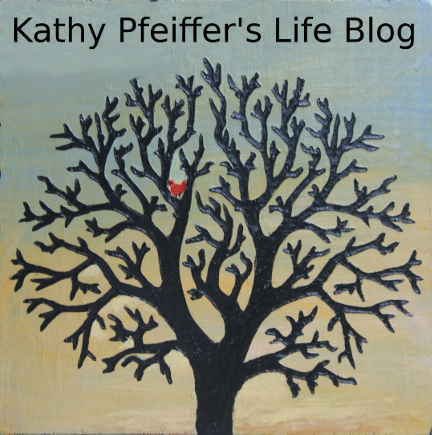 We naturally cave inward when we are cold, wrapping our arms around our chest. This actually constricts the blood flow to the arms, and makes them colder. Try walking with your arms down and slightly behind you, chest leading as you walk. You’ll be amazed at how much warmer you become. Don’t forget a good hat too, and then go outside and have some fun!